Amra Bangali (“We are Bengalis!”) is a people’s movement in India, a Proutistic samaj movement based on the values and objectives of PROUT. 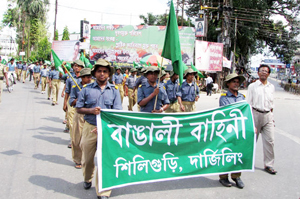 The Amra Bangali movement is wedded to the idea that the quality of life of poor people will only improve only when people are encouraged to attend to their own socio-economic and cultural needs first in a manner that efficiently and sustainably utilizes local natural resources, establishes local economic control, and puts and end to the various forms of direct and indirect foreign exploitation and drain of resources out of the local area. The movement is organized in West Bengal, as well as in other states with large Bengali populations such as Tripura, Bihar, Orissa, Assam and Jharkhand. Re-organization of the territory of Bengal with all like-minded people who have respect for Bengali language and culture, and giving the new name Bangalistan to this territory. me also support the concept of economic democracy and unification of bengalis in india. But there is no presence of this party in kolkata or no website. how can i connect with this party? please inform..
Amra Bangali is a unique samaj movement formed on the lines of Shri P.R.Sarkar otherwise known by his spiritual name Shri Shri Anandamurtiji’s unique philosophy.The devotees of Ananda Marga call Him ‘Baba’.Anandamurtiji has divided the world into 266 socioeconomic zones or samajas for their respective socioeconomic and spiritual developments.Every individual living in a particular samaj,whether one belongs to any other samaj must merge into the samaj in which he is living in for the welfare of the particular samaj and himself.That is nature. Eastern India has been divided into the Bangla samaj,the Oriya samaj,the Asomia samaj,the Bodo samaj and the Lepcha samaj by Shri Shri Anandamurtiji.The Bangla samaj is passing through a very bad patch as the Bangalis have been divided by caste,creed,religion and particularly petty politics.Movements for Bangali unity are now being felt in West Bengal,Bangladesh,Tripura and Cachar.The socioeconomic,cultural and spiritual development of the Bangalis are possible only when we shed our caste,creed,religion and petty political mind sets and merge into one samaj which is the Bangla samaj.There are 266 samajas to be uplifted in the world for the good of mankind.So,why not start the humble beginning of uplifting our own Bangla samaj ? That is why Amra Bangali movement was started.Please read P.R.Sarkar’s books and join in the movement. I’m a member of dis particular team or samaj. vai aii no ta ki amra bangali org er no?? In the last moment of the colonial rule in India,few political and social leaders of undivided Bangla tried to keep it as a unified body,but failed.Later on in 1971 the Eastern part of divided Bangla became a New Nation called Bangladesh. I feel it is an useful blog for the glorious past of the people on this land.Thanks to Dr.Dhruba Hojal for his good writing. Amra Bangali organisation ki sudhu kaguje andolan karbe. Airakam movement hole bangali antarjali jatra hoye jabe. Jodio antarjali jatrar dike paa barieche. jodi truely bangalir o banglar valo chan tabe asun amara trulely andolon kari o kaj kari. Kumirer kanna darkar nei. Sir, do something for bangali jati. Please united bengali and organised a movement against abangali who have occupied the business through illegal process with help of bengali political leaders and officers in Bengal. Please organised a team who look after the Bangali who do want to business. Without money donot progress the jati and culture. Why don't we see you people around doing something when West Bengal is continuously being infested with savage non Bengalis, who are up in arms in running over our land , culture, language and most important socio economic structure? They have infiltrated Bengal politics whereas in the neighbouring states, where Bengalis once took education and culture, they have almost killed every Bengali Political workers and even MPs and MLAs with complete impunity. You don't have any mass awareness programme to instil hopes in Bengalis like us who feel alienated day by day fearing, that a day is but too near when we the Bengalis become a Minority in West Bengal.